Being a Blogger I have the awesome opportunity to follow some of the best in the business when it comes to creating. These people are “artist’s” in the truest nature of the word. One of those people is Crouton Jacks and his Crouton Crafts. I stumbled across him 2 years ago and have been a fan ever since. He’s truly creative and one of the nicest men I know. It’s an honor for me to call him my “Friend” as well as a mentor. Crouton Jacks is also one of the best teachers. His style is calming. I say that because when I am trying to learn a new stitch. A pattern, make a cake or just watching so I understand the steps. I prefer his way. I’m a visual learner and sometimes I have to watch the video over and over to create my project. His style is calm and relaxed!! 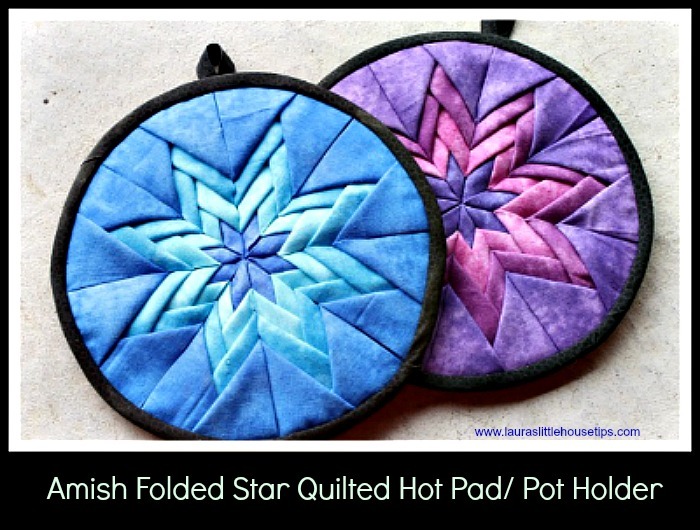 His latest video is a How To: Amish Folded Star Quilted Hotpad / Pot Holder Tutorial is Wonderful. I hope you love this DIY-Amish Folded Star Quilted Hot Pad/ Pot Holder Video Tutorial as much as I did. We love to see pictures if you make this yourself 🙂 You may just be featured on Little House Tips. If there is something you would like to learn. Please feel free to drop us a comment or email. We will do our best to get it up for you. These hot pads are so gorgeous. I have added them to my to-make list. I bet they would make beautiful presents. Preeti recently posted…Quilt in a Jiffy??? That’s great Preeti – So thrilled you liked it. And you’re right – perfect item for a homemade gift!!! These are so pretty! I may have to try these. I hope you do, Devon! Be sure and let us know how you make out, would you please? We love feedback! That is so pretty. They look like they would make great DIY teacher gifts too! Great idea Scarlet. I know I made a few as gifts and was blown away at how much they are treasured. I love your herb infused water. Yum! That’s a great idea Scarlet! I hadn’t thought of teacher gifts! Thanks so much for dropping a line– we really appreciate the feedback! Gorgeous! I need to get my sewing machine out again! I highly recommend it Ellen. They are really easy and I gave a few as gifts and was so touched by their responses. Thanks for stopping by. I just love your site and read it often. These are beautiful! I wish i knew how to quilt. It would be fun to have a set of these. Love it! The blue one reminds me of Frozen! Thank you so much Roberta! Blue is my favorite! Very beautiful! I wish I could quilt! Love the tutorial though. I am always tempted to try this type of quilting project but I know that I would be addicted and end up spending hours on making so much. Nice work! I am in the middle of making one of these right now! His instructions are great. I love both of his YouTube channels. He seems to be into the same things I am – cooking, crochet, and quilting…only, he’s good at it! I’m learning lots from him and think it’s fun. Not sure how he wrangles those pieces of fabric by fabric pressing only. I have to steam iron the triangles and stomp those suckers flat before I can do anything with them. I’m still kind of technically challenged in finding info I need. Is there any way to contact him to ask a question or two? I just bought an old Singer and it looks like he has one too. P.S. – this whole website is great! Lots of fun stuff here! I want to try Water Kefir! Oh I love them!!! I’d love to have you come over and link your post up to my craft party which starts at 7pm EST. and is new every Thursday! I also pin every post! Thank you so much. I’d love to join in. Your blog is wonderful. I. Love. This. They are beautiful!! Thank you for sharing! Such a beautiful craft, and a new crafter to discover! So glad you shared with us at Merry Monday! These pot holders are just beautiful. I love the colors of these ones. If you like Pinterest, I would love the Pin for this post entered into our Pinterest Game, it is fun and all entries are re-pinned. 3 random winners get FEATURED and then everyone re-pins them. I can’t wait to give these a try. I’d better get sewing! the video tutorial is a great help! Just visited Amish country in Lancaster, PA and saw some of these quilted pot holders. I have made them in the past and am so glad to visit your site and get a refresher course on making them. Thank you so much for sharing the tutorial. Do you know how I can contact your friend, Crouton Jack? I have watched his video for his crochet puzzle ball over and over and over and over and can’t get the second row to match what he is demonstrating or his written instructions. I’ve crochet for many, many years, and this has me totally frustrated. I can’t find anywhere on YouTube where I can contact him. Another viewer left basically the same issue asking for clarification, and there hasn’t been a response. Thank you for your helP! !